Beautiful cabin - perfect getaway! 4 bedrooms, 3 bathrooms, sleeps 13 comfortably with existing beds!! The cabin is conveniently located with year round access. It has all the amenities of home, all the furnishings you need. 4 bedrooms, 3 bathrooms, loft, family room, fire pit, satellite, wifi, big wrap around deck, 2 driveways for ample parking. We now have WIFI! The cabin is located 3.7 miles from Duck Creek Village, 33 miles from Cedar City, 7 miles from Highway 89, 52 miles from Bryce Canyon and 44 miles from Zions National Park. The cabin is near Brianhead Ski Resort, Cedar Breaks, Navajo Lake, Panguitch Lake and Strawberry Point overlook is just up the road. 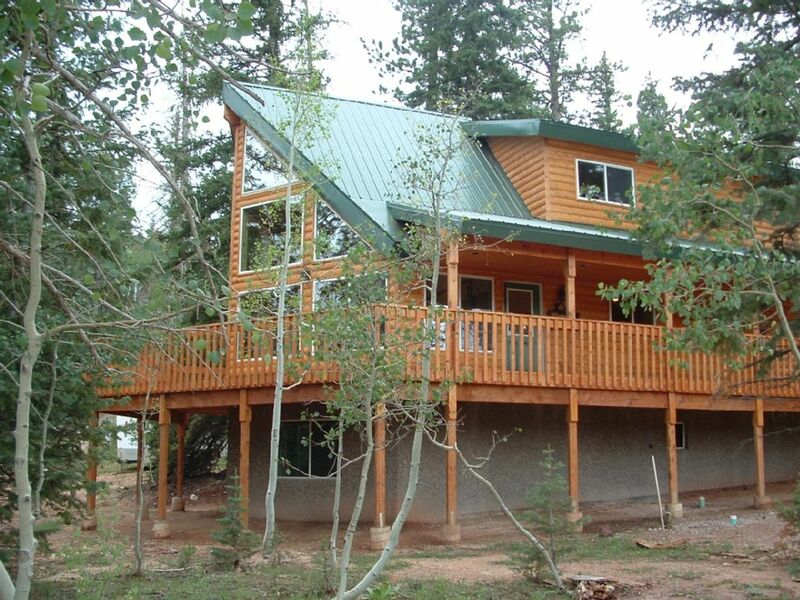 This cabin has year round access and lots of ATV or snowmobiling trails. This cabin is conveniently located and easy to get to and there is a lot of things to do in the area or just relax. It's a perfect getaway! There are many ATV and Snowmobile trails to ride. The recreational activities are endless. Lots of sight seeing within minutes of the cabin. Close to Duck Creek Village for shopping, restaurants gas, ATV rentals, etc. This property is so nice and homey...........you will feel at home. It's very comfortable, my family loves to go here and we have built a lot of memories. There's a lot to do in the area or doing nothing is nice too! It's a great getaway! Easy Access! Lots of Parking! Bring own detergent if using the washing machine. Couch, loveseat, chair, tv. Also Family room in basement has 2 couches and a loveseat and big screen tv. Has pots, pans, silverware, plates, glasses, etc. Dining room table seats 8 and 3 bar stools at bar, in loft another table that seats 4 and folding table and chairs in closet if needed. Horseshoe Pits, patio table and chairs, grill, card tables and chairs available for extra dining if needed, and a table with seating for 8, 3 at bar, table for 4 in loft, firepit and firewood available. We loved this cabin and we will do it again when we get a chance. Perfect place for get away. Loved how clean everything was. Super nice people to work with. Thank you so much Mya, glad you enjoyed your stay! Hope you will come back again! This property is so beautiful! The cabin is spacious and inviting. This was our second time staying at this property and we are even more in love with this cabin! There is enough space for everyone to gather together, we had 9 people with us! But also enough space to separate from the group if you wanted to just read or take a nap!!! The windows were perfect for viewing the snow while staying nice and warm inside! I cannot say enough good things about this cabin! We can’t wait to visit it again next year! Oh and the WiFi works perfectly!!! Thanks so much Jessica! I hope you do come back and stay with us again! The cabin was absolutely perfect for our stay over the Christmas holiday. It's a beautiful cabin...the windows are amazing! We woke up Christmas morning to snow and enjoyed a nice morning walk around the neighborhood. The floor plan is great for a large group, WiFi worked well, and we LOVED the wood burning fireplace. Thank you so much and I’m so glad you had a great Christmas! Our family enjoyed the Cabin so much! The cabin was perfect. They provide everything you need, just bring food. View is beautiful. Highly recommend but I don’t want to tell too many people, or it won’t be available to rent! Thank you Stephanie, I appreciate your feedback and hope you do come back! It is very lovely place. Very clean and organized. They have basically have everything ready so we just had to bring our own food. All beds are very comfortable. I definetely coming back this cabin on Dec and Jan again. Also awesome owners <3 Thank you so much ! Property is located at Strawberry Point Road and Pine Loop, approximately 3.7 miles from Duck Creek Village. The rent is $300 per night plus tax (11.2%), half due at reservation and the other half due 30 days before arrival. Cleaning fee of $140 is due at departure. When you sign the contract you sign that you authorize a $500 security deposit, but it is not charged unless there is missing or broken items at departure and at that time it would be discussed with you. Pets may be welcome for an additional fee, please inquire.